The league of extraordinary books. I was recently given the book Never Let Me Go by Kazuo Ishiguro. I never normally hurry through books, but I enjoyed this one so much – despite a few plot holes – that I finished it in 48 hours. It’s usually an annoyance when I know an author is withholding information, but Ishiguro has the main character Kathy drip-feed us as she remembers. At times, it was hard to remember there’s a male author behind the words, as her voice is spot-on. At some point during this 48 hours, I decided to contact the author to give my thoughts. Here’s where I hit a wall. He has an official Facebook profile, but my message was rather long and few people on the site read lengthy posts. There was also a danger that it would be buried under other comments. So I decided to look for an e-mail address. The e-mail address on his profile, however, was for Random House, but the book was published by Faber & Faber. 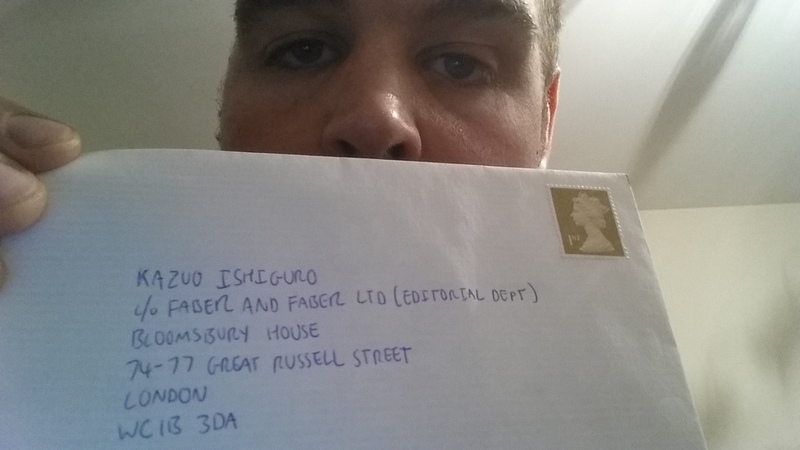 So I visited the publisher’s website and looked for an official way to contact Ishiguro. Rather quaintly, Faber & Faber insist that readers must contact their authors by post. The picture shows my envelope ready to be posted. Yet as I was writing, I realised the power of a physical letter. As more communication becomes electronic, it becomes harder to ignore the few envelopes dropping through your door, just as receiving an e-mail in the late 1990s would have stood out a mile. The last time I really enjoyed a book, it was The House That Groaned by Karrie Fransman. Some of the twists actually made me gasp out loud, and she incrementally sets up the explosive ending throughout the story, but the reader only snaps together the pieces in the last few pages. I sent her a Twitter message to say I’d enjoyed it so much I’d finished the whole thing in one sitting. There was a chance she might not have seen this message among tons of others, or she could have easily forgotten about it. However, Fransman did reply, and wisely took the opportunity to tell me about her next book Death of the Artist. Incidentally, I spoke to her briefly at a launch of Death of the Artist, and she jokingly told me not to finish it in one sitting as her books take so long to craft. I’m always upfront in saying I’m not a lifelong writer, at least not of fiction and poetry. So when I read Starter for Ten by David Nicholls, it didn’t occur to me to write to him. You might know it from the inferior 2006 film. There’s a chance I enjoyed this book so much because it’s set in a university, and either I was coming to the end of my first time in tertiary education or had recently graduated – I can’t remember which. But even aside from that, the main character Brian Jackson is someone who’s oblivious of his own stupidity, yet painted in such a way that the reader can’t help but feel sorry for him. Indeed, it’s one of the few books I’ve read twice. Alas, I’m unable to write to the author of my final extraordinary book as Ella Cheever Thayer died in 1925. Her 1880 novel Wired Love was a real eye-opener for me. It tells the story of a young telegraph operator called Nattie Rogers who begins chatting to a mysterious male operator at another station and develops a crush on him. Just like today’s online dating, Nattie reads his messages and tries to second-guess what he really means and wants. The novel also feels contemporary with its proto-feminist feel. Throughout the story, Nattie remains the one in control of the relationship. All the main characters are female too, with the men portrayed as slightly dimwitted, though both genders appear to run the telegraph network on an equal footing. The best part is that the novel is now in the public domain so can be read free of charge as an e-book. This website provides more analysis and links to the book. I would imagine that most authors would love to be written to, I’m never quite sure who is running social media platforms – is it the author themselves or a helper….. I think we must tell authors, writers, musicians; any creative folk – when we enjoy something that they have made. I believe it does make a difference to both the recipient and the sender. Thank you very much. I think anyone deserves to know when they’ve done a good job, no matter how famous they are. I suspect the letter will still go to an underling and perhaps I won’t receive a reply, but I’m convinced it won’t be ignored. Previous Previous post: Stepping off the train. Next Next post: In which I launch my spoken word recording, The Purple Spotlights EP.